Specialist in the skin glue base technique, Dominique Pérotin has been painting - exclusively on wood - for 30 years. After training under G. Cleton, Dominique started her career working in Paris for Françoise Thibault. Having lived in Provence, at first in Castellet then in The Cadière d' Azur, she receives now at her home in her workshop of Péaule, in the South of Morbihan, where she is settled since 2015. Since then Dominique Pérotin has devoted herself to the painting of boats and marine scenes. 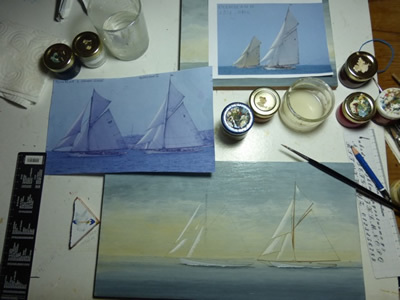 She exhibits her works primarily at the main regattas and gatherings of boats, whether Latin sailboats, classic yachts or working boats, including regattas in Marseille, Saint Tropez, Sanary, Vannes, Imperia and Antibes. Dominique Pérotin at her studio by appointment only.